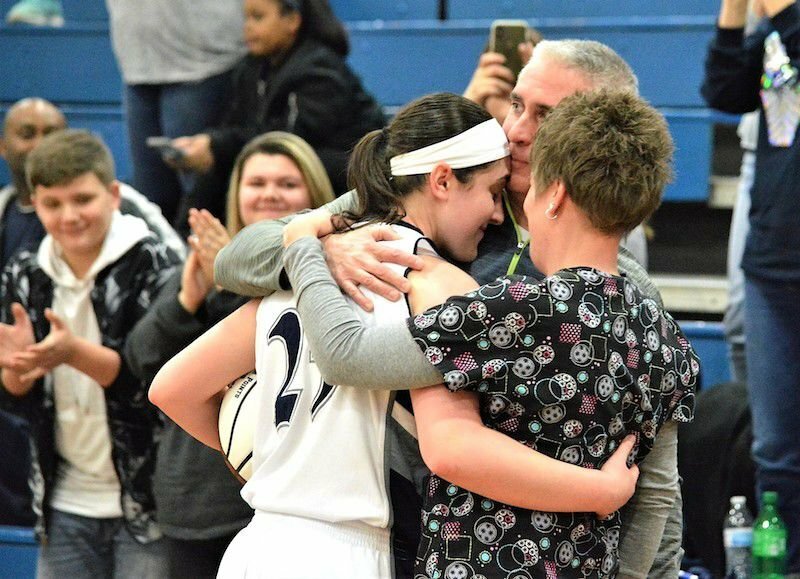 Valley High senior Hannah Foster shares a hug with her parents, Richard and Kelly, after she scored the 1,000th point of her Greyhound career last Tuesday in a 56-30 loss to Midland Trail. Valley's Taylor Oden yanks a rebound away from Midland Trail's Laurel Johnson and Jenny Wilson. Valley's Quinten DeMello drives the baseline against Greater Beckley Christian Tuesday. The Crusaders prevailed 95-57. Zach Winter advances upcourt for the Greyhounds. 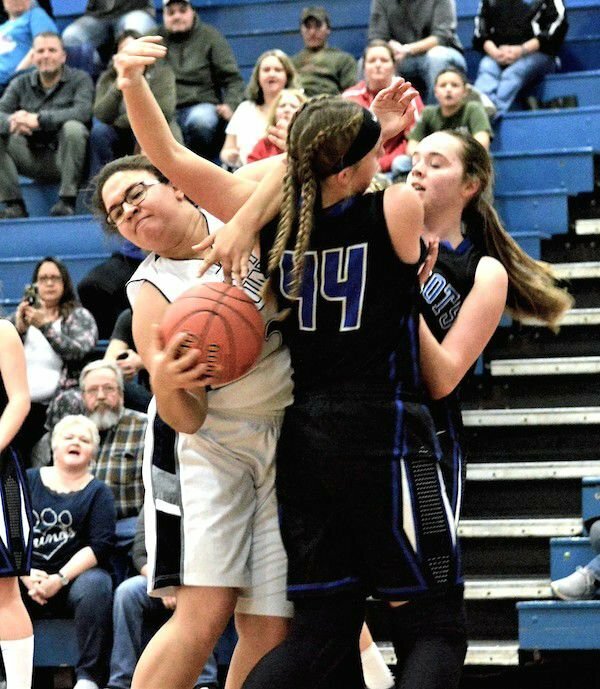 The Midland Trail girls controlled the action throughout last Tuesday to cruise by the Greyhounds 56-30. Emily Dickerson tallied 13 points, including a 3 of 4 showing in 3-point goals, to lead the Patriot offense. Jenny Wilson and Malerie Hendrick supplied 12 points each, and Meghan Gill tallied eight. Wilson had seven rebounds, four assists and four steals, Laurel Johnson grabbed 13 rebounds, and Gill and Gracie Ferrell had five boards each. Also, Kyleigh Jackson had three assists, and Johnson, Hendrick and Taylor Perry collected three steals apiece. During the game, Valley senior Hannah Foster scored the 1,000th point of her career. She hit a pair of free throws in the third period, her fourth and fifth points of the game, to reach exactly 1,000. Gracie Gipson led the VHS offense with 13 points. Valley went on to drop a 91-21 verdict to Summers County on Friday. Valley dipped to 2-3 Friday with the boys setback to host Charleston Catholic. Adam Falbo provided 16 points to lead the Valley offense. Lucca Giannini added 10. Jimmy Harper and Zach Bess had five rebounds each. On the night, Charleston Catholic's Robby Williams netted 23 points and surpassed the 1,000-point career scoring plateau. Aiden Satterfield supplied 17 points. Catholic held a 21-3 lead at the end of the first quarter. The Greyhound girls and boys will play in the UKV YMCA Holiday Tournament on Dec. 28-29 in Montgomery. 3-point goals: V: 5 (Falbo, L. Giannini 2, Armentrout, Ford), CC: 5 (Williams, Satterfield 2, Jenkins, Suddeth). A 31-13 outburst in the third quarter lifted the host Crusaders over the Valley boys Tuesday. For Valley (2-2), Lucca Giannini netted 16 points, Quinten DeMello had 14, Adam Falbo tallied 11, and Jimmy Harper scored nine. Jay Moore pumped in 26 for Greater Beckley, and Orlando Potter chipped in 16. 3-point goals: V: 3 (Giannini, Crisp, DeMello), GBC: 8 (Fisher 2, Jordan, Walton 3, Edwards 2). The Capital boys toppled Riverside Thursday in the Par Mar Holiday Classic. For the Warriors, Javante Elzy tallied 17 points.